Samson, you are a good kitty but we don't think Delilah is a bad kitty! I am swooning! Is there a perfect and handsome kitty club? Maybe you should start one? Samson, you do have a special good glow about you. Baby thinks you're handsome too. 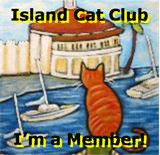 My friend, you are a perfect example of a member of the Good Kitty Club! You look great with that white light around you. Glad you got into the Good Kitty club. We are either in the Naughty Kitty Club or the Old folks club. Samson you are a very good kitty. Samson, you are obviously a VERY good kitty. Delilah? Not so much. 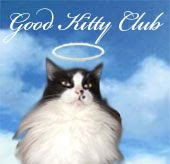 We are good boys also....and doesn't it feel good to belong to The Good Kitty Club. You are such a handsome fella, Samson. We luvsy'all. I can see what a good kitty you are Samson. I belong to that club too. Flynn doesn't. Nuff said. Oh dear! Looks like Deli needs to see a V-E-T! Samson, you are such a good kitty! Good AND handsome...quite the combo Samson! Samson, we think you certainly deserve to be a member of the Good Kitty club! Maybe Delilah can learn a thing or two from you - or maybe not! We know you are good! We also think Delilah is good too. 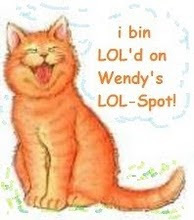 But concats on being in The Good Kitty Klub! Happy Mancat Monday to you. Yes, I agree! You are rather angelic Samson, but no cat is purrfect all the time. Dante is rather like you -- good most of the time. And then there's kitties like Deli! 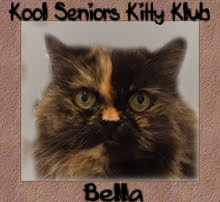 Is she enrolled in the Naughty Kitty Club by any chance? By comparison is the best way to be good. Any other way is just to much to ask for from a cat. Samson you are beyond handsome today!! That's a very angelic light around you...did your halo slip?